In case you are wondering what the best local restaurants are like, here’s a report on one, written at the beginning of September 2009 by our delightful New York visitor, Laura. Laura sent me a copy of her letter home, describing the meal she and her family had enjoyed at one of our favourite restaurants, in nearby Tourtour. 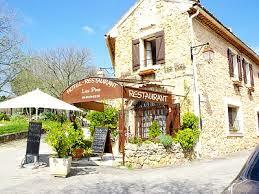 Laura has kindly given me permission to show it to other travellers to France who love food. I second everything she says about her meal ! It’s hard to imagine a day of better eating. When we talked about leaving to come to France, everyone said, “Wow. The food. You’ll eat so well.” I wish I could say something more complicated than this, but it’s just true. We are eating so well. Jessica, my lovely singing French teacher friend came to visit last week with her husband Nick. She is a serious foodie. After she, Nick and Bill came back from the market in Salernes, she whipped up a raspberry tart with no apparent effort.While the tart baked, we sat out on the picnic table on the lawn and ate salad, cheese, bread, twisty pesto pasta, and sausage that Nick found that combined the magic of meat with the sorcery that is Gorgonzola. I served my new favorite lemony white wine, and Nick, the uber-wine guy (though never, ever the wine snob) brought us a bottle of Beaujolais to have afterwards. I can only use the word “sinful” to describe just how good it was to eat like that in the middle of a Sunday afternoon in such a beautiful place. I love the chance to eat fresh, unprocessed, and beautiful food here. Tomatoes. Zucchini. Peaches. Beans. Raspberries. Heaven. You will love it here when you come to visit. But our day of food was by no means done. Before our lunch was even over, before the food coma, using the magic of iphones, Nick and Jess looked for restaurants nearby. Les Chenes Vertes (“The Green Oaks”) was, happily upon happily, open, with a table for six at seven. Our new friend Alexia had recommended this to Bill, so we were confident it would be delicious. We drove up the twisty road to Tourtour, the bells ringing in Villecroze just as we drove through the center of town. We sat at a huge table on a veranda overlooking the valley below. Each of the three sections of the table could have seated six at a restaurant in Brooklyn. The Menu de Degustation (“Tasting Menu”) involved the combination of dozens, likely hundreds of specific ingredients combined in exacting proportions, using precise techniques, and resulting in life-altering flavors. First, the chef came out to ask us all what we might like to eat, including the girls. We adults would taste ourselves into oblivion with eight teeny little courses (eight!) The girls could elect a little simply prepared chicken, some fish or beef. The waiter brought us double-size glass shot glasses filled with a rainbow of layered fruit purees. He set the glasses in front of each of us, then stood proudly at the head of the table to announce the name and ingredients of the dish, as though he were introducing visiting European dignitaries at a ball. Puree of Watermelon. Kiwi. Canteloupe. Tomato. On the top was a little frothy white meringue (froth of various kinds would figure prominently in the entire meal) and a sprig of mint. This little surprise totally baffled the girls — cold layered soup? Weird! — but delighted the rest of us. I was torn between wanting somehow to taste every fruit separately and mixing it together into a sort of off-green sludgy looking best smoothie ever. I tried it, and loved it, both ways. Course #2. “Fleur de Courgette en Beignet.” I translate this literally as “Zucchini Flower Donuts,” each just one blossom dipped in batter and fried into a three-petaled little fritter. Big grey salt crystals clung to the fried batter. Rather than stress out over the appropriate way to eat it, I picked it up in my fingers and chewed on the petals. Course #3 was the appetizer that we got to choose. Jessica and I had a very carefully composed salad topped with a perky little Cooked crayfish, head, tail and little grabby claws intact. The salad was crab and tomato shaped into a circle in the middle of the plate, acting as a stand for the crayfish. At the bottom of the plate was a hard boiled quail egg, an arrangement of several perfectly cooked asparagus spears, and two tiny raw white almonds that someone had actually peeled. At the very top of the dish was a little savory stacked snowman : a peeled cherry tomato, an anchovy wrapped into a little scarf around that layer, then as a head the most amazing salty black olive I have ever had. At first I thought that the anchovy might mean that I should forego the snowman food stack, but when Jessica decided to eat it, I did too. I shared the little bits of crayfish with the girls, who believed it to be the world’s most adorable lobster. At the same time that Jess and I were unraveling the mysteries of the crabmeat appetizer, Nick was eating a sort of escargot pot pie, the snails suspended in an eggy, garlicky soufflé. Bill had ordered tete de veau, a dish that should properly be spelled with several accents I still don’t know how to produce on my computer. The dish disappeared before any of us could even ask whether he was enjoying it. He later described the dish as tasting “like meat butter,” and looking “very anatomical.” It looked like a dissected slice of the little calf’s neck, and he could see where the vertebrae would have been. Surrounded in a horseradishy mayo, this dish could have been a total ethical and gustatorial gross-out. But for Food Crusader Bill, it was bliss. I can’t promise you that I have not mixed up the order of the next two courses, but I believe that Course #4 was a few lovely ounces of sea bass floating in artichoke foam along with a little piece of roasted fennel and a tomato that had been prepared in a way I have never seen. This was the same fish that Grace ordered and described as “the best fish I’ve ever had,”. Course #5 brought us face to face with even more little crayfish attitude, as each plate arrived with the top half of a little orange crustacean staring us down. This was crayfish flan sitting on a bed of about 35 carefully spiraled spaghetti noodles covered in green zucchini sauce. There was also an orange something called “jus de carcasse.”. It really was transcendent. Course #6 was actual dinner, again our choice. I had grilled gigot d’agneau, in honor of the two little romping lambs we saw on the road just before reaching the restaurant. It was served in two tiny little pieces, each hugely flavorful. On the top of the plate was a tomato crusted in a melted blue cheese. On either side were two swoops of sauce, a yin and yang made with one side horseradish, the other side mint. Jessica and Nick each had “Bresse” chicken with foie gras, piled on top of a dark, rich sauce and a little bundle of risotto wrapped in a leaf that none of us could identify or translate. Course #7 involved more honey. As though to bring us down safely from the flavor-high of the main dish and ease us towards the “Grand Dessert,” this was a little bland circle of panna cotta topped with honey and another unidentifiable treatment of tomato. You’d think that by now we would be wholly gorged. Impossible to tempt with dessert, no matter how wafer thin. Sure, each of the courses was just a few luscious bites. But there were so darn many of them. I assumed that dessert would be a little piece of chocolate cake, perhaps, or some flowery fruit made into yet another boulle of mega-flavored glace. To tell you the truth, I usually am not a huge dessert fan, and rarely get quite as excited about the sweet part of the meal as I do about the starchy sides. I was not prepared for what was to come. Each of us, all six of us, received a plate with individual bites of FIVE different kinds of dessert. Plus a little separate dish of a three-tablespoon portion of chocolate mousse on the side. For those of you who prefer to have someone else do your math, that was a total of thirty-six desserts served to our table. Top left hand corner of each plate was an almond macaroon. Top left was sliced poached pears with chocolate on the top and some lovely mushy sweet white stuff underneath. Bottom right was a thin cookie shaped into a basket full of arranged cut fruits and a vaguely cinnamonny cream filling. Bottom left was a caramelized apple plus whipped cream. And dead center was the world’s tiniest and most intense melty chocolate cake, cooked around a slice of banana. I generally find bananas in dessert to be a wholly mistaken idea, but in this case the three bites nearly made me cry. Just after he set down our plates (and the wholly unnecessary additional plates of semisweet chocolate mousse, garnished by a sugar-glazed mint leaf) the world’s most gracious waiter also brought two little towers of additional cookies and a basket of fruit. “Just in case,” he joked. On the tower, Grace found the new meaning of her life in the form of cream puffs, each about the size of a big marble. She put one in her mouth, and immediately exclaimed, “Why didn’t I taste one of these when I was younger?” as though the first decade of her life was time wasted, so far from the delights of cream and puff. We rolled back into our two cars, and slithered back down the hill from Tourtour. By the time we got home, there was no reason even to continue to converse. Eight courses worth of dinner had had the last word. There are also two Alain Ducasse restaurants nearby, each an easy drive away, as well as small family restaurants for less elaborate celebrations.